wish they had been written by me. Instead they are from Irresistable Revolution. 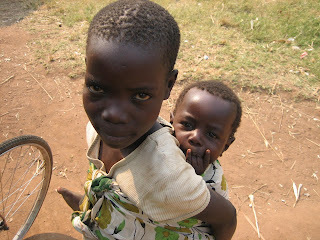 My heart is sad in being away from all I love in Uganda and from the impending crisis of food rations being cut. But I have hope that people will raise their voices and calamity can be avoided. I believe deep down we do care. I'm in dialogue with Invisible Children and UgandaCAN and others about what can be done. For now, we pray and we take what action we can. and there I will be buried” (Ruth 1:16 – 17). "...Unless Christians fulfill their prophetic role, unless they became advocates and defenders of the truly poor, witness to their misery, then, infallibly, violence will suddenly break out... If the time comes when despair sees violence as the only possible way, it is because Christians were not what they should have been. If violence is unleashed anywhere at all, the Christians are always to blame. This is the criterion, as it were, of the confession of sin. Always, it is because Christians have not been concerned for the poor, have not defended the cause of the poor before the powerful, have not unswervingly fought the fight for justice, that violence breaks out."